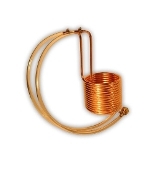 25' 38" ID Copper immersion wort chiller. Comes with tubing and garden hose/wash basin connection. Adapter sold separately for kitchen hookup.